What parent doesn’t dream of their kids to learn while playing? Today making this dream come true is possible and easy with the help of building and engineering toys. Your budding engineer will enjoy playing with these amazing kits. And the best thing? They will learn lots of science in the meantime. Building and engineering toys for the 10-year-old set are extremely varied. They are usually called STEM (science, technology, engineering, and math) toys as they help to develop skills in all these areas. 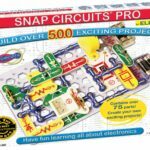 The Snap Circuits PRO SC-500 Electronics Discovery Kit is your kid’s best introduction to the incredible world of electronics. This toy won numerous awards, including The National Parenting Center Seal of Approval and Dr. Toy 100 Best Children’s Products. The kit allows making over 500 different projects that can show your child what electronics are capable of. The instructions included in the package are very detailed, yet written so clearly, your 10-year old will be able to understand it. You can also download them from the Elenco website anytime. The kit includes 70 color-coded circuit components that enable kids to work out how different types of electronics work. As it’s a snap kit, playing with it is easy and safe. 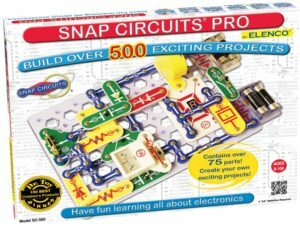 Your Snap Circuits PRO SC-500 will have a LED display, slide switches, FM radio module, and more interesting parts. Your kid will be able to build a small circuit board similar to those in many electronic devices. Highlighting similarities like this will help children understand how the skills they learn can apply in real life. 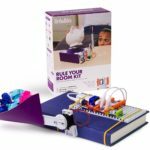 The littleBits Base Kit – Rule Your Room is another holder of multiple awards for educational toys. This is a truly extraordinary STEM product that can help kids to not only learn more but also develop their creativity. The kit can be applied to every item in the child’s room to produce an original and exciting invention. 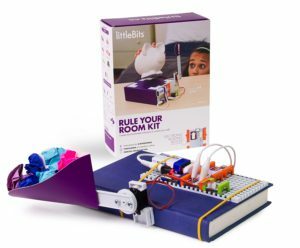 Among building and engineering toys, the littleBits Base Kit stands out due to its extreme versatility. The product comes with instructions for 8 different applications and one challenge. However, these basic projects are simply a preparation for more creative applications. Your children are sure to enjoy finding new ways to automate different items with the kit. The activity is extremely fun for both adults and kids. It also helps develop STEM skills better than the majority of other toys available today. The littleBits Base Kit is a toy for the innovators of tomorrow. The best thing about it is that it’s perfectly safe and can be easily managed by a 10-year old. The projects need no soldering or even wiring. must-have for raising a STEM-savvy child. The apps controlling Dash come with built-in programming challenges, so your kids will learn how to code while playing. The robot needs no batteries and can be charged via a USB cable. It comes fully assembled, which increases toy safety. The controlling app itself is extremely fun as it makes developing code as easy as ‘finger painting’. If your child is already familiar with coding and robotics, or simply ‘too big for kiddy stuff’, try Wonder Workshop Cue Robot. This will not only be more of a challenge code-wise, Cue is also a robot with an attitude. This little fella is powered by an advanced emotive AI that can share jokes and make witty comments. It’s equipped with a variety of sensors that enable children to design complex routes and challenges for the robot. 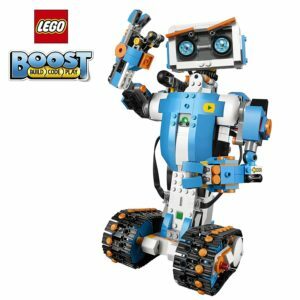 Your kid needs the LEGO Boost Creative Toolbox 17101 Building and Coding Kit (847 Pieces) if you want them to fall in love with robotics. It’s also a smart purchase if you already have some LEGO building and engineering toys. All of them are compatible and combining various items boosts child’s creativity. The kit allows one to build five different robots (one at a time). One of those is a guitar, so you can make your little coder a musician as well. Each of the projects has a variety of sound effects and can be managed with a tablet app. The LEGO Boost truly is a toy for STEM-savvy kids. It’s a challenge to those who know nothing about coding, but a joy to everyone who loves LEGO. The kit includes a playmat that can be used for some specific challenges. LEGO robots from this kit have color, tilt, and distance sensors. Note that the LEGO Builder (one of the available robots) can make mini-LEGO models. 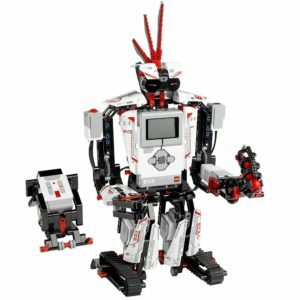 The LEGO MINDSTORMS EV3 is a step up from the LEGO Booster. It has more interesting and advanced features, but it’s harder to code. It’s one of the more complex engineering toys available now. It will be a good choice for those who already love and are somewhat skilled in robotics. The robot can be controlled through infrared sensors. The coding interface offered by LEGO runs on Macs and PCs and there are apps for Android and iOS available. The MINDSTORMS page of the official LEGO website features a variety of exciting instructions from fans. The kit allows building one of the five different robots. It’s a highly creative and rather advanced STEM toy that will not only walk and talk as instructed. 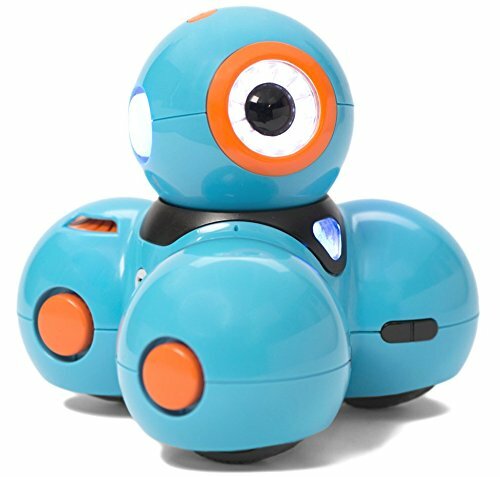 These robots run on AI that can think for itself and will challenge your little coder. Once your 10-year old beats all the toy can offer, you can switch to advanced programming options for a bigger challenge. 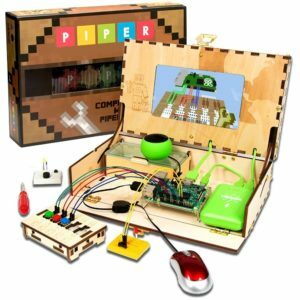 With the Piper Computer Kit| Educational Computer That Teaches STEM and Coding, the name says it all. It’s one of the best building and engineering toys for 10-year olds who are fascinated with computers. It is, in fact, a self-contained computer in a hand-crafted wooden case. The device features an LCD display, Raspberry Pi 3 project board (1.2Ghz quad-core CPU & 1 Gb RAM). It includes a variety of electronic gadgets ranging from LED lights to motion sensors. There’s even a Raspberry Pi Minecraft edition included to ‘sweeten the deal’ The Piper Computer can use Wi-Fi for sharing and more advanced gaming. The Thames & Kosmos Remote Control Machines are for kids who love all kinds of motorized vehicles. They are rather versatile and complex but easy to build. Remote control cars have always been a favorite of children and Thames & Kosmos take it to a new level. Their machines are not mere STEM toys, they are a handbook of a young engineer. The kit includes 182 building pieces and 3 motors for boosting your child’s creativity. There’s a large booklet with instructions and designs and you’ll be able to create 10 different vehicles with the kit. 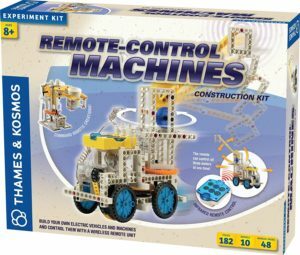 Note that the Remote Control Machines are compatible with other STEM products from Thames & Kosmos. This enables even more creativity development for your little engineer. The remote control has 6 buttons and is touch-sensitive. It’s so fun to play with. You will love it as much as your kids. The kit allows controlling all three motors from the kit at the same time. The kit is versatile, so you aren’t limited by the ideas offered in the instruction booklet. STEM toys teach kids to not only accept that electronic items work but to understand how they do. Therefore, your child comes to realize that every element of the system plays a vital part. Even the most active child can settle for hours playing with building and engineering toys. The ability to focus on the task is invaluable in preparation for school and adult life. Working with STEM toys children learn that they must be patient and calm to build the item they want to play with. The majority of STEM toys allow kids to build their own designs by combining various parts. Manufacturers of these items also help encourage creativity by offering challenges and contests. Few things help build up self-confidence as effectively as the success of seeing your toy creation work. STEM toys encourage kids to try finding solutions if their projects fail. This skill is combined with creativity as they can use a variety of different methods to fix the problem. Don’t forget that working with building toys also improves hand-eye coordination, motor skills, and generally boosts a child’s IQ. Nowadays, teaching kids to love science is easy. Various STEM toys are fascinating to play with and so versatile, each kid will find something to enjoy. If you want to get your child into robotics, try building and engineering toys from LEGO, like Booster or MINDSTORMS series. Young coding and computer lovers are sure to enjoy a Piper Computer Kit or Wonder Workshop programmable robots Dash and Cue. If you want to introduce your 10-year old to the science behind electricity, try Snap Circuits or littleBits kits. 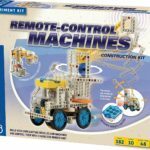 In case you are looking for a child’s all-time favorite remote–controlled cars, the Thames and Kosmos kit would be the best option.